Photograph courtesy Mark Bennett On July 11th 1981 25220 & 25177 worked the 08.35 Derby - Yarmouth to Norwich, coming back with the 14.20 ex-Yarmouth from Norwich. The pair are seen at Derby at the end of their day out. The almost nineteen year career of 7570/25220 included a short time at Leeds Holbeck and longer spells on the Western and London Midland Regions. Royal Train cabling modification (cab front circular access point). Time between withdrawal and scrapping: 34 months. 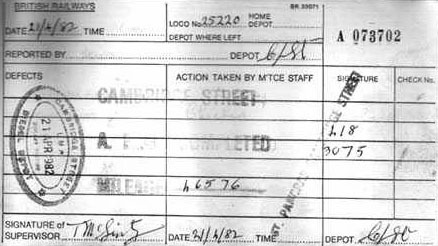 April 1966 to LM Midland Lines. August 1967 to Birminghm Division (D02). August 1967 to Leeds Holbeck (55A) on loan, then made permanent. September 1972 to London Division Western Lines (D01). 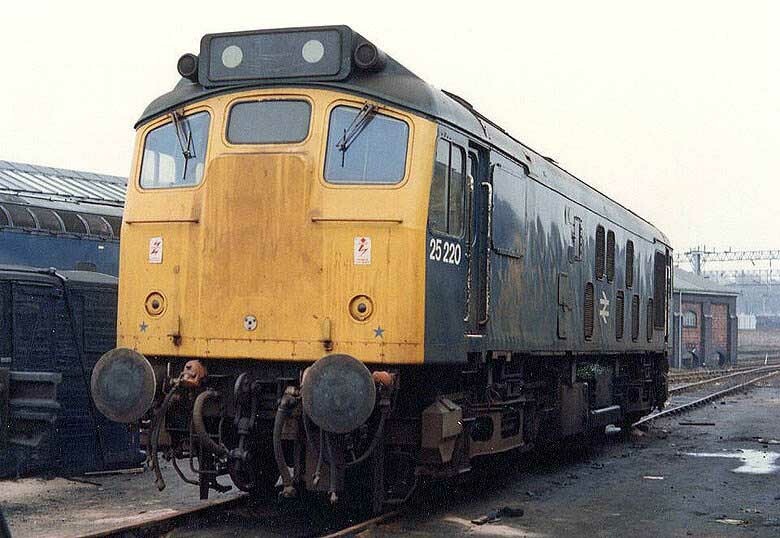 25220 was the 130th Class 25 withdrawn, one of three retired during June 1982. After withdrawal 25220 was moved to Derby Works by August 1982 and remained here until moved to Swindon Works (with 25050/062, 25129/133/146, 25220/233/274/294) on February 3rd/4th 1985 and scrapped there the third week of April 1985. Photograph courtesy Adrian Healey 25220 (showing its No.2 end) & 40018 at Derby Works on March 15th 1983. 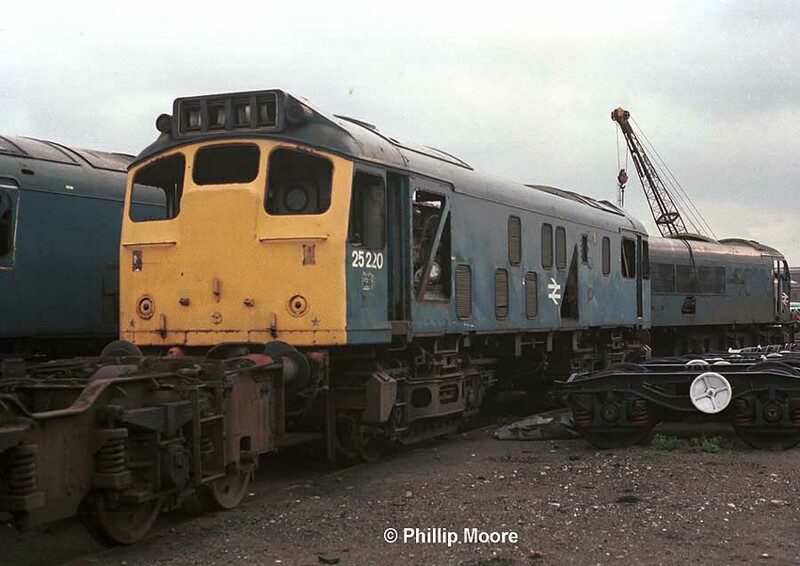 Photograph courtesy Phillip Moore 25220 (showing its No.1 end) at Derby Works on November 26th 1983. In comparison with the view above the detail differences between the two cab fronts can be noted. Noted Derby Works June & July 1975 (gangway doors removed, full repaint). Noted Derby Works October - December 1977. Photograph courtesy Tony Sayer One cab from 25220 at Derby Works on March 18th 1978. 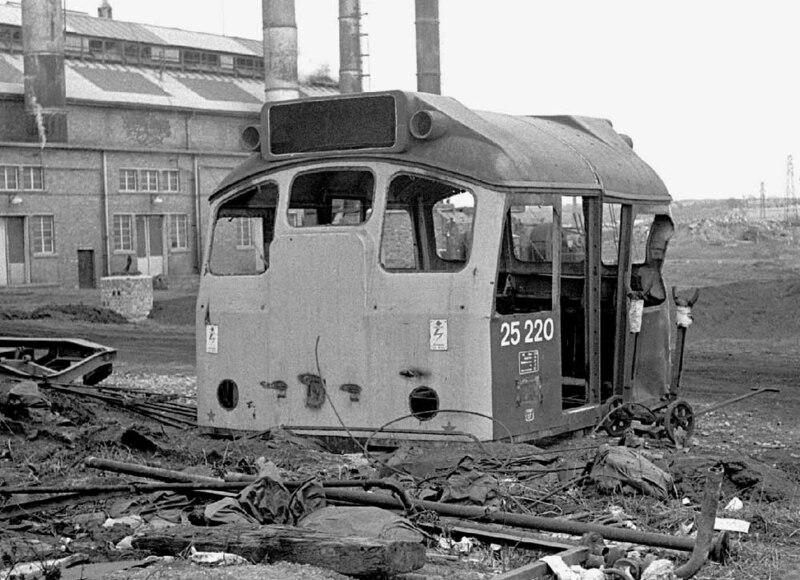 This cab was presumably removed from the locomotive during its visit to Derby Works during the last quarter of 1977. At the last update of this page (November 2016) the recorded passenger mileage of 7570/25220 placed it in the top ten for passenger mileage worked, wth 19,262 miles now identified. Condition November: green livery with small yellow warning panels, curved upper corners, warning panel coveres frame level stripe. Although the Sheffield - Llandudno Town summer dated passenger workings were usually powered by Sheffield area locomotives, on July 6th 1968 the round trip was worked by 7570 & 5149. On July 2nd 7570 worked the 17.30 Manchester Victoria - York throughout. On July 27th the 10.05 Manchester Victoria - Morecambe was worked by 7570 & 7540. On February 23rd 1972 the 10.00 Liverpool - Newcastle was noted at Huddersfield with 1551 piloting 7570 (was the Class 25 present for steam heat purposes?). The return 15.45 Newcastle - Liverpool was worked by the same locomotives. On August 10th 1973 7570 & 5357 worked a Stranraer Harbour - Euston as far as Carlisle. During May 1974 25220 was transferred to the Western Region, initially to Bristol but in July 1975 it moved further west to Laira where it was able to acquire more passenger mileage. Photograph courtesy Gordon Coltas 25220 stands at Plymouth Laira on May 25th 1975 in very shabby condition. Within a matter of days it will be moved to Derby Works for overhaul, which will include the sheeting over of the gangway doors and a fresh coat of blue paint. During late June it will be outshopped and will return to Laira. Ex-works 25220 worked a morning Nottingham - Lincoln parcels on July 15th. With eighteen months spent at Laira the recently outshopped 25220 was able to see service on a number of passenger workings which included a variety of local workings out of Exeter. On August 30th 1975 25220 was stationed at Par to provide assistance to the heavy summer trains working over the Newquay branch. Assistance was given to the 08.45 Newquay – Manchester behind 45010, returning with 1063 & twelve coaches prior to both working the 13.22 Newquay – Paddington. 25220 was noted with passenger coaches at Exeter St Davids on June 19th. On August 6th 25052 & 25220 worked the 19.45(?) St Blazey - Temple Mills freight, being noted passing Liskeard at 20.23. 25220 continued on a variety of passenger duties on the the Exeter / Newton Abbot workings throught 1976. The last recorded passenger working whilst at Laira took place on November 27th 1976 working the 20.00 Newton Abbot - Paignton, a journey of eight miles! Christmas 1976 at Tyne Yard found 25063 & 25220 laying over after they worked the 3E07 21.40 Bristol - Sunderland parcels of December 23rd. 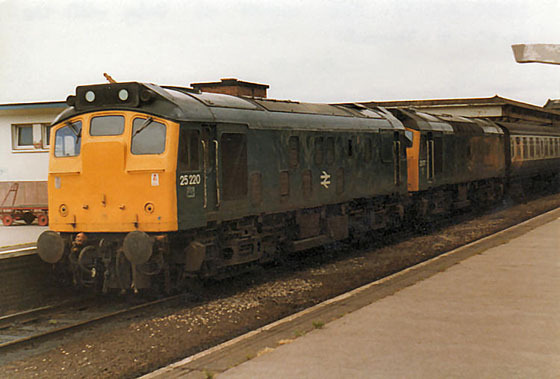 With its transfer to Cardiff during December 1976, 25220 began a lengthy period in which the Cardiff - Crewe services featured prominently. It was noted on a variety of Crewe - Cardiff workings between December 9th & 14th. 25220 was active on the Crewe - Cardiff services between March and September. Dates noted include March 19th, April 1st/2nd/12th/23rd/26th/30th. On July 3rd 25220 & 25029 worked the 08.45 Birmingham New Street - Barmouth to Shrewsbury, returning from there with the 17.30 Barmouth - Birmingham New Street. Crewe - Cardiff services continued on July 8th, August 4th/29th and September 24th. 24047 & 25220 were active in the Stoke on Trent area on June 19th. 25220 was noted on the Crewe - Cardiff services on June 24th/29th/30th. Photograph courtesy Dave Plimmer On July 14th 1978 Prince Charles made a visit to Bangor from ? 25220 & 25221 were in charge of the train as it arrived at Bangor, whilst 25219 was used to shunt the stock at Bangor, the empty coaching stock later headed east. During July 25220 was noted on Crewe - Cardiff services on July 19th/20th/22nd/24th/25th. The working on July 22nd was double headed by 25220 & 25269 with the ten coach 07.50 Cardiff - Crewe. On August 3rd 25220 worked the 15.08 Cardiff - Crewe. Two weeks later 25220 strayed a little from the Crewe - Cardiff runs. On August 15th 25220 worked two Manchester Victoria - Bangor roundtrips. The first week of September was quite hectic for North Wales workings, beginning on September 1st with a Crewe - Holyhead relief. Two days later (3rd) 25220 & 25169 worked the roundtrip 'White Rose 2' (North Wales Railway Circle) Bangor - York railtour, totalling 429 passenger miles. Between September 4th & 9th 25220 was busy working to Llandudno Town & Bangor from either Manchester Victoria or Crewe. With the end of the 1978 summer season 25220 returned to the Crewe - Cardiff line, being noted working passenger services on September 25th, October 1st & November 11th. 25220 was noted on Crewe - Cardiff workings on January 1st/3rd/7th/28th, February 3rd, March 30th, April 5th, May 17th/28th, June 2nd/19th/20th/24th. 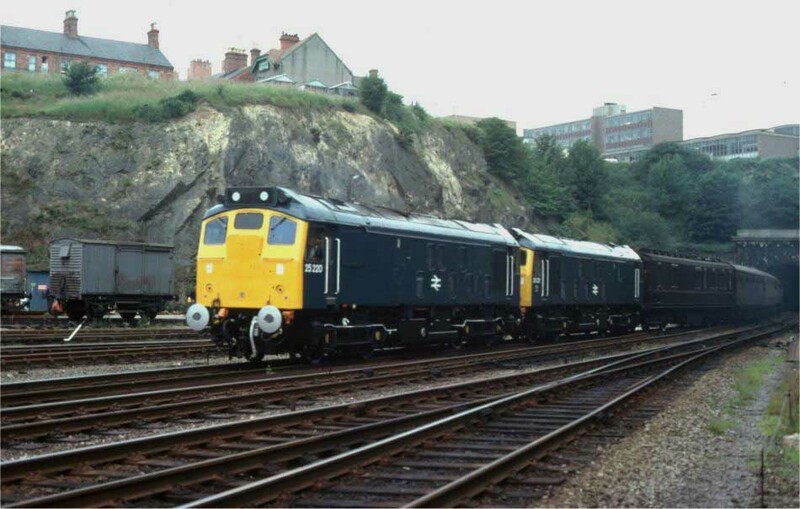 On July 3rd 1979 the 08.12 Leeds - Birmingham featured 25220 & 31216 which returned north on the 09.58 Weymouth - Leeds! On July 27th 25220 worked the 09.40 Manchester Victoria - Llandudno Town. 25220 returned to the Crewe - Cardiff services being noted on September 3rd, October 12th/13th. Passenger workings for 25220 during 1980 continued to see the Crewe - Cardiff services predominate, being noted on January 11th/20th, March 1st/10th/19th/29th. However during March 25220 strayed from the Marches line, on March 4th 25220 worked the five (?) coach 11.20 Crewe - Derby andd the following day (5th) worked the 10.15 Birmingham New Street - Norwich and 15.18 return, a 350 mile day out. Crewe - Cardiff workings continued on April 14th/19th/20th/21st, May 10th/13th, June 16th/21st/23rd. 25220 & 25160 worked the 18.10 Llandudno - Birmingham New Street on June 24th, presumably as far as Crewe. On July 6th 25220 worked the 03.54 Crewe - Birmingham New Street, and was noted back on the Crewe - Cardiff workings on July 23rd. August Crewe - Cardiff workings included 25220 & 25027 on the 10.00 Crewe - Cardiff on August 2nd and 25220 alone on the 17.10 Cardiff - Crewe. 25220 was also noted on the Marches line on August 6th. Crewe - Cardiff workings continued on October 4th/11th/12th/23rd/29th/30th, November 9th/15th, December 6th/11th whilst on the evening of December 28th 25220 & 25042 handled a nine coach Crewe - Cardiff passenger on the evening of December 28th, and finally a working on December 29th. The first two weeks of January saw plenty of activity for 25220 on the Crewe - Cardiff services, being noted on January 1st/7th/9th/10th/16th/17th. No passenger workings have so far been recorded for February, but during March 25220 was again noted on the Crewe - Cardiff services on March 3rd/21st/24th, whilst on March 22nd 25220 worked the 04.10 Crewe - Birmingham New Street. On March 18th 25220 worked a Leicester - Didcot parcels. 25220 was noted at Cardiff Canton on March 30th. During April 25220 was working Crewe - Cardiff services on April 11th/13th/15th. Crewe - Cardiff services worked by 25220 during May include May 2nd/3rd/7th/10th/11th/25th. On May 4th 25220 & 25042 worked a round trip Longbridge - Aberystwyth day excursion, another 280 miles travelled. Photograph courtesy Peter Lovell 25220 accelerates out of Hereford with the 17:10 Cardiff – Crewe on May 2nd 1981. The Class 47 on the following Hereford – Paddington has been very quick off the mark in running in to the platform. 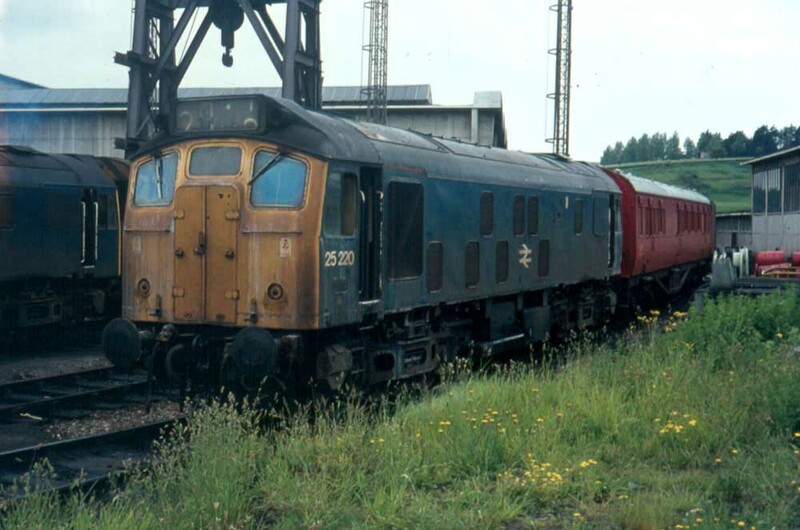 May 31st 1981 was officially the last day for the Class 25s on the Crewe – Cardiff workings. 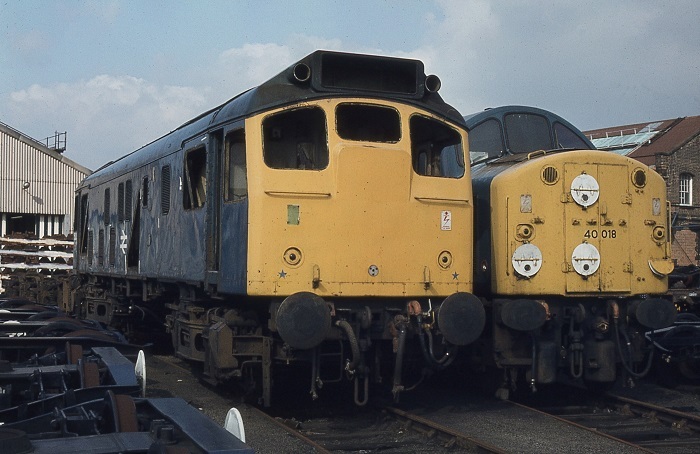 The Southern Region were intending to release Class 33s from discontinued van traffic workings to take over from the Class 25s, however a strike on the SR and continued operation of the van traffic permitted some Class 25s to remain on these workings until June 4th. Throughout the last week 25042/60/66, 25219/220/245 handled the diagrams although by midweek 25220 was replaced by 47099. On July 11th 25220 & 25177 worked the 08.35 Derby - Yarmouth to Norwich, coming back with the 14.20 ex-Yarmouth from Norwich. Four days later (15th) and now with 25169, 25220 worked the 09.28 Derby - Skegness and 18.40 return. A winter's day out on December 11th 1981 took 25220 and another high passenger mileage machine, 25224, on a roundtrip Birmingham New Street - Aberystwyth working. 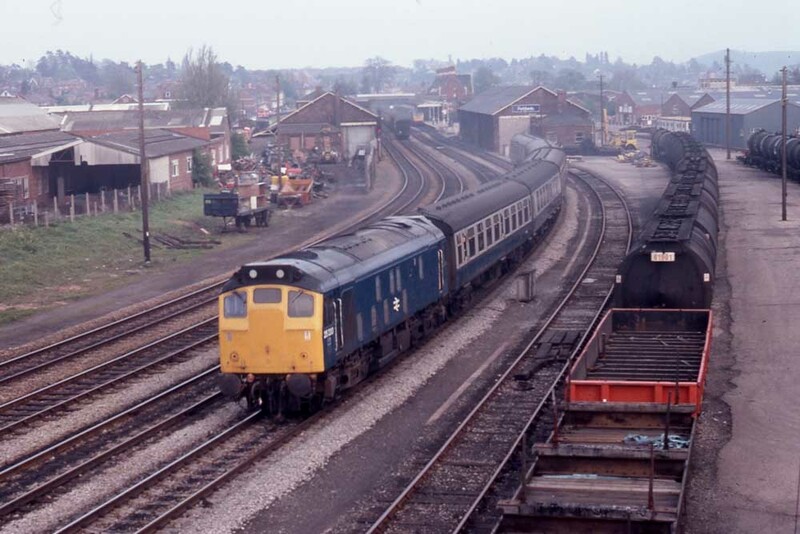 Photograph courtesy Paul Bettany 25220 stands at Cockshute on February 20th 1982. 25220 was noted on March 9th's 13.45 Manchester Victoria - Bangor following the failure of a Class 47 prior to departure from Manchester Victoria. 25062 & 25220 were noted heading eastbound through Wakefield Kirkgate on March 11th with a lengthy train of Mermaid ballast wagons. 1982 was 25220's last year in service and managed three busy days during April. On April 15th & 16th 25220 worked the 02.10 Manchester Piccadilly - Cleethorpes and the following 08.26 Cleethorpes - Doncaster (load ten coaches/vans on 15th). Its final recorded passenger working took place on April 17th 1982 working the 07.42 Manchester Victoria - Bangor and 11.03 return. Four days later 25220 was at Cambridge Street (St Pancras) receiving an 'A' exam (see image below). 25220 was withdrawn on June 13th 1982. Page added February 21st 2013.